The Interdisciplinary Social Sciences Journal Collection consists of nine journals and an annual review. 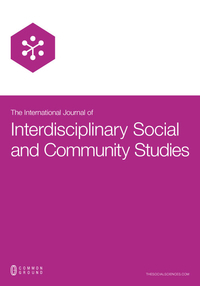 The Interdisciplinary Social Sciences Journal Collection encourages the widest range of submissions and aims to foster the highest standards intellectual excellence. Available in electronic and print formats, we are committed to expand the visibility, reach, and impact of research published in the journal collection. Reviewers are selected on the basis of subject matter and disciplinary expertise, and review scores based on clearly articulated criteria, leading to fairer and more precise feedback. We take seriously the "peer" of "peer review." After having work accepted for publication, authors become reviewers, making the journal truly the collaborative work of a Knowledge Community. For their constructive contribute to other community members’ work, reviewers are listed as an Associate Editors in the journal. We don’t put undue weight on institutional affiliation, stage in career, previous publishing experience, national origins, or disciplinary perspective. If the paper is excellent, it will be considered for publication. Journal authors, as Knowledge Community members, have subscriber access to the journal collection and book imprint. Authors can make their articles freely available via the Hybrid Open Access option.